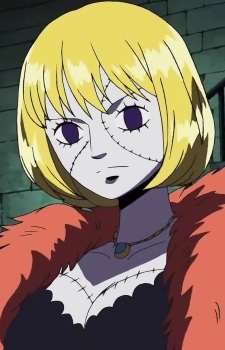 Victoria Cindry (ビクトリア・シンドリー, Bikutoria Shindorī) is Dr. Hogback's servant. She hates plates, to the extent of serving food directly onto the table, and constantly expresses her wish for all of the world's plates to vanish. According to Hogback, she has a tragic past - her master proposed to her, that she could test his love for her. But then she crushed his ten valuable plates, and he rejected her, and thus she has a habit of throwing plates. Her zombie number is 400. Her history is later revealed to be a lie, and Hogback reveals her real story. Ten years ago Dr. Hogback proposed to Cindry, but she rejected him because she already had a fiance. Later she fell from stage and died in an accident. Dr. Hogback was devastated when he found out and later made a deal with Gecko Moria that he'd work for him if he could bring Cindry back to life.